Father's Day is just around the corner and there are so many fantastic Dads in the world, we decided to give away some fantastic prizes to six of our lucky readers. One winner will receive a copy of A Brave Bear and a £100 John Lewis gift voucher, with five runners-up receiving a copy of A Brave Bear. From the author of Hoot Owl, Master of Disguise and the illustrator of Wild, comes a story of a daddy and a baby bear, on a day that's as hot as hot can be. 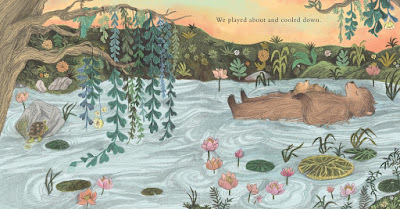 When Dad Bear says, "I think a pair of hot bears is probably the hottest thing in the world," Little Bear suggests that they go all the way to the river to cool down. But what will happen when Little Bear tries to impress his dad by doing a big jump across the rocks? 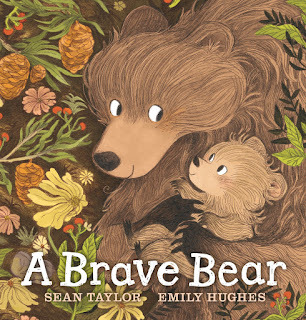 Told from the perspective of Little Bear and capturing his determination to be big and brave just like his dad, the youngest of readers will rejoice in the gorgeous characterization, the warmth of the storytelling and the deliciously detailed artwork of illustration star, Emily Hughes. To enter, just email competitions@walker.co.uk with the subject line FATHER'S DAY. Hurry, competition closes soon! Just in time for Father's Day on 15/06/17. Pick up a copy of A Brave Bear at your local bookshop, and join in the fun and download our free A Brave Bear activity sheets here.